Two years on from the delivery of Thomson Airways’ first 787 Dreamliner, the UK’s largest holiday airline has announced it will take delivery of up to four new, larger Boeing 787-9 Dreamliner aircraft to expand its long-haul programme. Demonstrating its continued commitment to the Dreamliner, Thomson Airways has converted two existing orders for 787-8 (for delivery in summer 2016) to the new larger capacity 787-9 aircraft. The airline has also placed an order for a third 787-9 with an option to purchase a fourth, growing its Dreamliner fleet to 13 aircraft by June 2016. These new aircraft will be used on Thomson Airways’ most popular long haul routes, including Mexico’s Caribbean coast, Sanford in Florida and Jamaica, due to customer demand for holidays in these destinations. The new, longer 787-9 aircraft will allow Thomson Airways to take more holidaymakers to these destinations with a capacity of 345, including 63 Premium Club seats (16 more Premium seats than in the 787-8). In destination, customers will enjoy the choice of nearly 120 hotels, including two of Thomson’s flagship Sensatori Resorts and four of Thomson’s Couples Resorts (Thomson Sensimar from summer 2016) in Jamaica and Mexico’s Caribbean coast. Holidaymakers can also look forward to exciting new destinations flying on Thomson Airways Dreamliner in the future, as the new aircraft have a longer range than the original 787-8 fleet with the ability to fly an additional 830 kilometres (or 450 nautical miles). 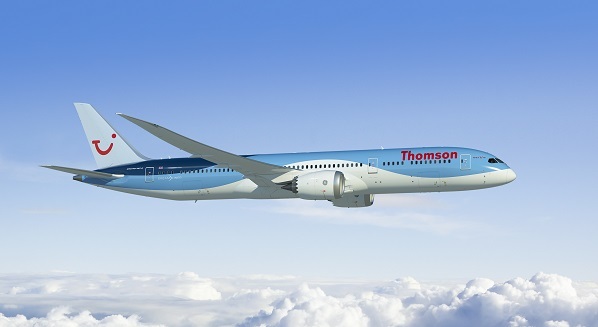 John Murphy, managing director for Thomson Airways, said: “We are delighted to continue to expand our Dreamliner fleet with the addition of these larger 787-9 aircraft, allowing more of our customers to enjoy the revolutionary flying experience as they travel to their holiday destination. Murphy added: “The Dreamliner is one of many ways in which we are innovating in the air. Last year we unveiled our five year vision to change the face of holiday flying through new state-of-the-art aircraft, more long-haul destinations and innovative on-board product and service concepts. Thomson Airways was the first UK airline to operate the Dreamliner and has been flying it on long-haul routes since July 2013.